50 Cent, rapper, actor, and entrepreneur was born Curtis James Jackson III in Queens, New York to Sabrina Jackson on July 6, 1975. His mother, who had given birth when she was 15 years old, raised him by herself while dealing cocaine. She died when Jackson was eight. After his mother’s death, Jackson lived with his grandparents in Queens. Jackson’s adolescence coincided with the rise and spread of crack cocaine in urban America, and his teenage years were defined by hustling and run-ins with the law. After briefly taking up boxing, the lure of fast cash drew Jackson to the street life. He was arrested and jailed multiple times for selling crack, and by the mid-1990s began to drift into music. As a rapper, he borrowed the name “50 Cent” from a well-known 1980s stick-up kid from Brooklyn named Kelvin Martin. The new 50 Cent’s first break came when he was introduced to Run-DMC DJ Jam Master Jay in 1996. Although over the next couple of years he recorded albums that were never released due to record label politics, he was still staying busy. His single “How to Rob” increased 50’s profile with its imaginary scenarios of how he would stick up some of the biggest names in rap music. The song drew responses from several famous rappers, including Jay-Z. On May 24, 2000, 50 Cent was shot nine times by unknown assailants outside his grandmother’s home in South Jamaica, Queens.He spent 13 days in the hospital, was unable to walk for six weeks and emerged both physically and mentally changed. One round penetrated 50’s jaw, and the resulting injuries contributed to a distinctive vocal sound on the microphone. With a renewed sense of life purpose, he returned to making music, this time using the re-emerging underground hip-hop medium called the ‘mixtape’ as a vehicle. 50 eventually attracted the attention of Eminem, who signed him to his record label, Shady Records, as well as Dr. Dre’s Aftermath Entertainment. 50 Cent’s first commercial studio album, Get Rich Or Die Tryin’ (2003), produced by Eminem and Dr. Dre, debuted at #1 on the Billboard chart, spawned two number one hits, and sold millions of copies worldwide. Later that year 50 launched his own label, G-Unit Records. He subsequently released more albums which later achieved platinum status and signed other successful acts to his label including Lloyd Banks and The Game. 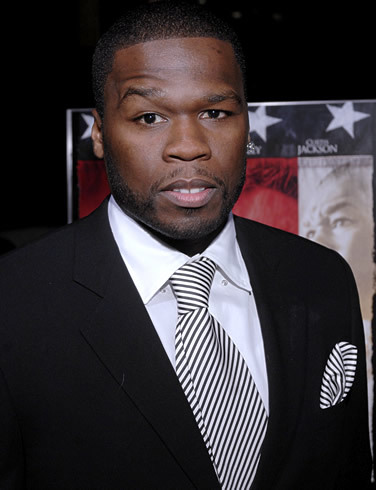 Using his success in music as leverage, 50 Cent developed a career in acting. His first role was in the semi-autobiographical Get Rich Or Die Tryin’ (2005) and he has since been in over a dozen other films, appearing alongside actors such as Samuel L. Jackson, Mario Van Peebles, Robert DeNiro, Forest Whitaker and Al Pacino. company where he created his own vitamin drink, Formula 50. 50 Cent reportedly earned $100 million when the company was bought by Coca-Cola. In addition, he launched the G-Unit clothing line and started a boxing promotion company with Floyd Mayweather, Jr.
50 Cent has multiple Grammy Award nominations and in 2010 won Best Rap Performance by a duo or group for “Crack In A Bottle” with Eminem and Dr. Dre. He has also won several BET, American Music, and Billboard awards. 50 Cent has one son named Marquise (born 1997) and has never been married.